Quality control is achieved most efficiently, of course, not by the inspection operation itself, but by getting at causes. As coauthor with Harry Gutekius Romig in Sampling Inspection Tables: Single and Double Sampling (1944), 41. The natural attitude of inspection is prone; we do not often observe accurately any object that rises much above the level of the eye. Concerning observing human nature. In The Characters of Theophrastus: Illustrated With Physionomical Sketches (1881), 7. Those who have dissected or inspected many [bodies] have at least learnt to doubt; while others who are ignorant of anatomy and do not take the trouble to attend it are in no doubt at all. Letter xvi, Art. 25, as translated by Benjamin Alexander. 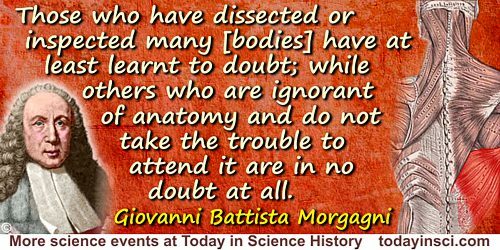 Cited in Edward W. Adams, 'Founders of Modern Medicine II: Giovanni Battista Morgagni', Medical Library and Historical Journal (1903), Vol. 1, 276.